O yes, StressMyPC is for 1 x CPU, 2 x CPU, 4 x CPU, ... Is also for Graphics Card, and Hard Drive Stress. Windows-10, 8.1, 7 / XP / Vista / Server 2016, 2012 and all other Windows PCs..
Is also good to test overclocking PCs or Laptops and if the cooling system is sufficient and works properly! (Image-1) CPU, Graphics(Video) Card, and Hard Drive stress on Windows-7! This windows utility stress test is designed for stress testing of personal computer, allows you to perform also called computer stress test. This form of testing will help you determine the stability of the system in conditions of increased load! The program is portable, that is can be launched from portable usb media, does not produce entries in the system registry and does not require the installation. StressMyPC - FAQ-1: Can i use StressMyPC for Stress and Test the Dual CPU System? Test for stress, how to stress test a computer? Is here a Free tool created to Stress the CPU? Can I do a Stress-Test for Graphics Card with StressMyPC? Ist StressMyPC good, for a Laptop CPU Stress-Test. 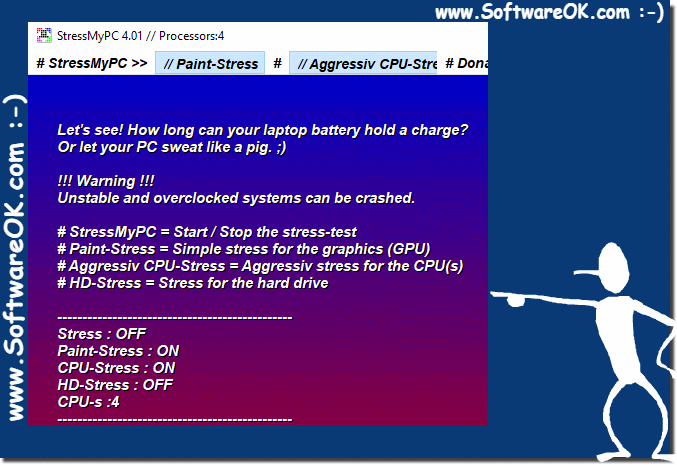 Is StressMyPC a simple performance testing tool for Windows-7? Is this a free stress tool for hard drive and video card? cpu stress test free download? Is StressMyPC good to Test overclocking pc or laptop? Is StressMyPC also good for testing cpu overclocks for stability? Can i Stress PC and test the dual-CPU system? is "Stress MY PC" a Free tool? Stress testing, stress pc, stress testing software!